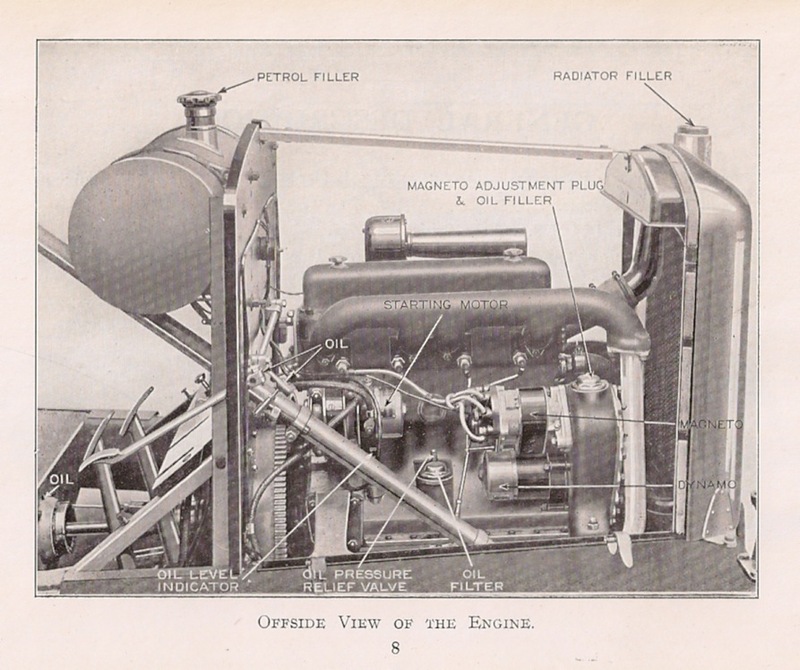 I show here views of the chassis and engine for the Mark One and Mark Two Armstrong Siddeley 14 HP car. The description in the handbook is “The four cylinder detachable head engine has a bore and stroke of 3″ x 4” (76mm x 102mm) giving a cubic capacity of 1,852cc. RAC rating is 14.4 HP and the British Tax £15. The wheelbase is 9′ 3″ (2.82 metres) and the track 4′ 8″ (1.42 metres), the ground clearance being 10 1/8″ (257mm). Overall sizes are: Length 12′ 6″ (3.81 metres) and width 5′ 6″ (1.68 metres).” This ground clearance was with standard, beaded edge tyres of 30″ x 31/2″. 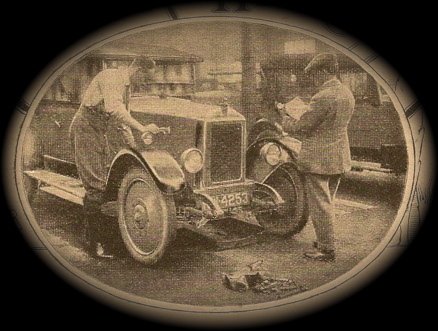 Balloon tyres of 29″ x 4.95″ were fitted to meet popular demands. 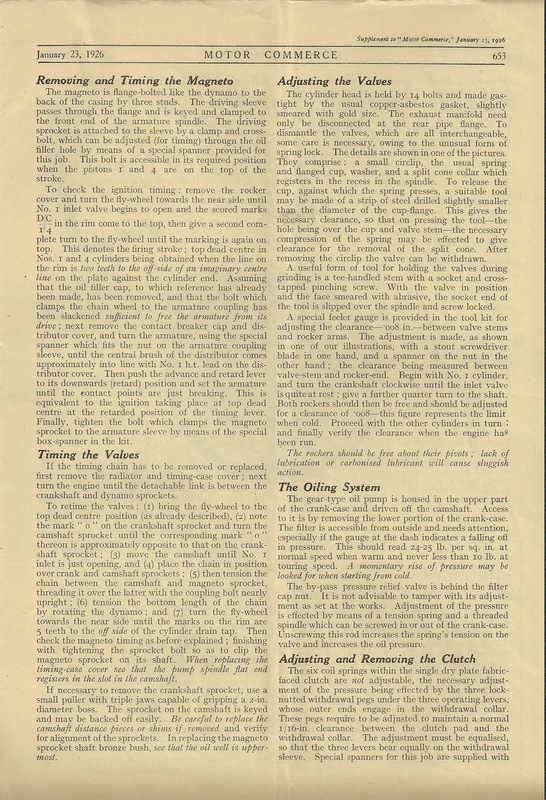 The handbook goes on to say: “Cantilever road springs have been adopted to both front and rear, to avoid wear on shackles and the lubrication of same. As in the 30 HP and 18 HP models the gear box is mounted in one unit with the rear axle on the forward end of the tubular propeller shaft casing. 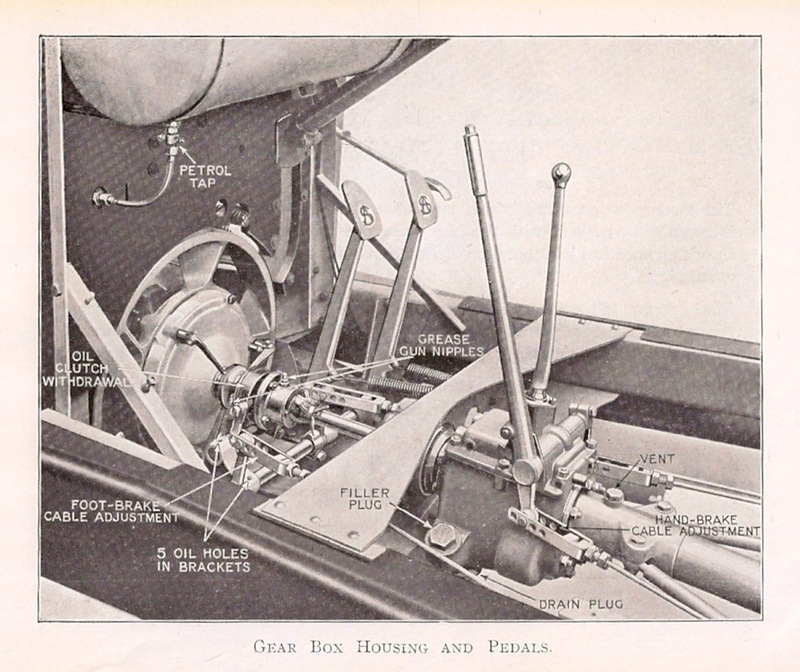 This construction eliminates all moving parts in the mechanism between the gear box and rear axle. The ratios in the 3-speed gear box are 3.72, 1.836 and direct, the ratio on reverse being 4.73, and the final drive to the back axle is by spiral bevel with a reduction of 4.7 to 1. 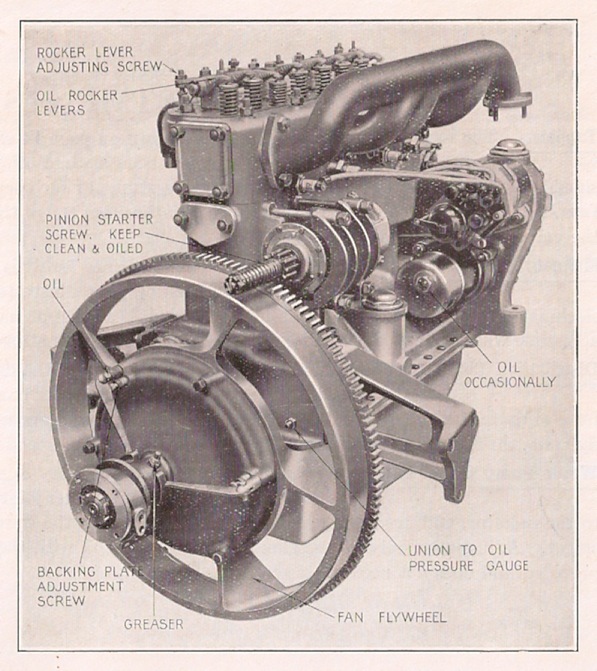 Note the large flywheel, with single plate clutch in the centre, at the rear of the engine. The flywheel helped create a smooth running engine and improved torque at slow speeds. Unfortunately, it also made changing gear a slow process as with a crash gearbox (with no syncromesh) the driver had to wait when changing gear for the engine and gear wheel to slow down to match the gear to be engaged. Below is the engine and chassis of the 14 HP Mark 2 which Armstrong Siddeley introduced in 1925. 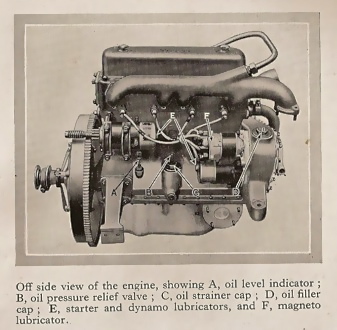 On the Mark Two model Armstrong Siddeley introduced the tube over the engine linking the exhaust to the inlet to pre-heat the induction gases; the engine became known as the “pram handle”. 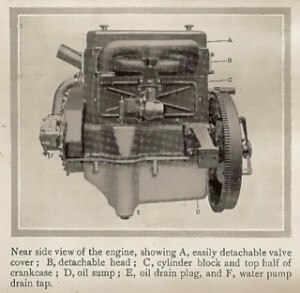 Otherwise, the general arrangement of the engine remained unchanged: the engine had a Claudel Hobson carburettor; the magneto and dynamo was driven by a chain connected to the crankshaft and camshaft at the front of the engine. The starter motor was mounted above the flywheel. 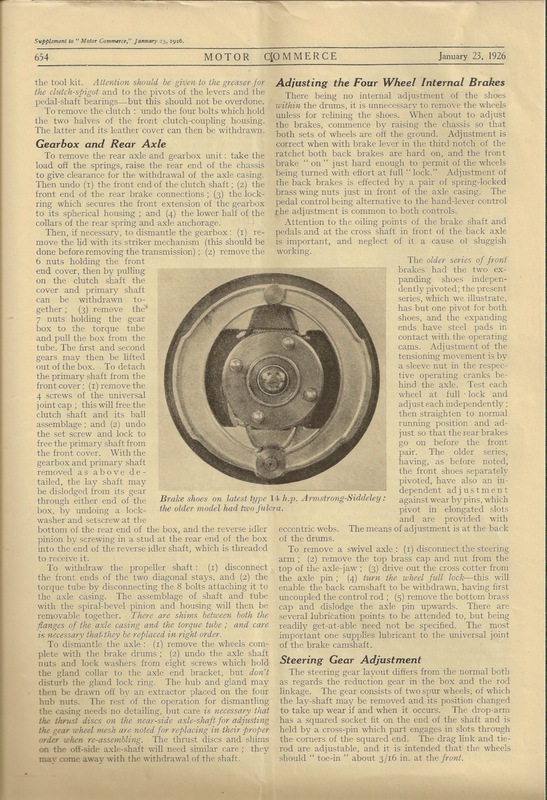 The other significant changes were the improvements to the brakes and road springs. 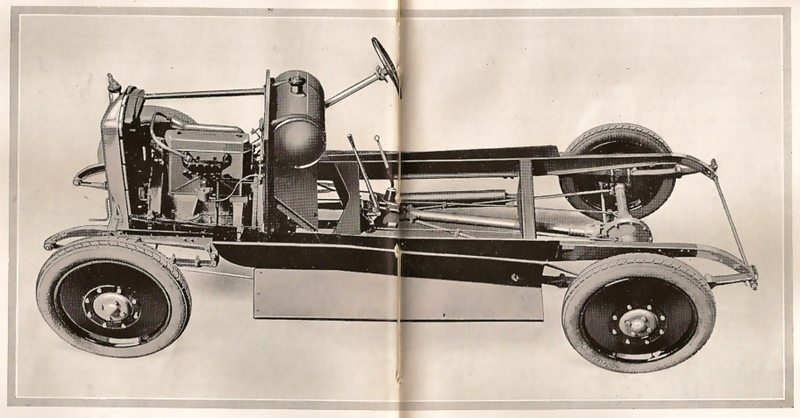 The Mark 2 had four-wheel brakes, rather than just two-wheel brakes as on the Mark 1, and semi-eliptic springs on front and rear axles, rather than cantilever springs. The changes improved the ride and overall performance of the car and made the model more competitive with other mid-priced 14 HP or 2 litre cars. 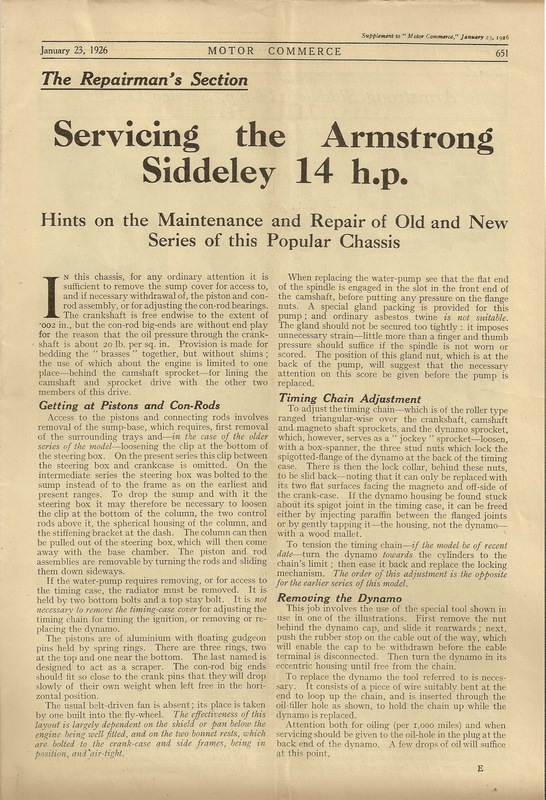 In 1926, Armstrong Siddeley changed the engine again, this time placing the exhaust and inlet on the nearside of the engine. 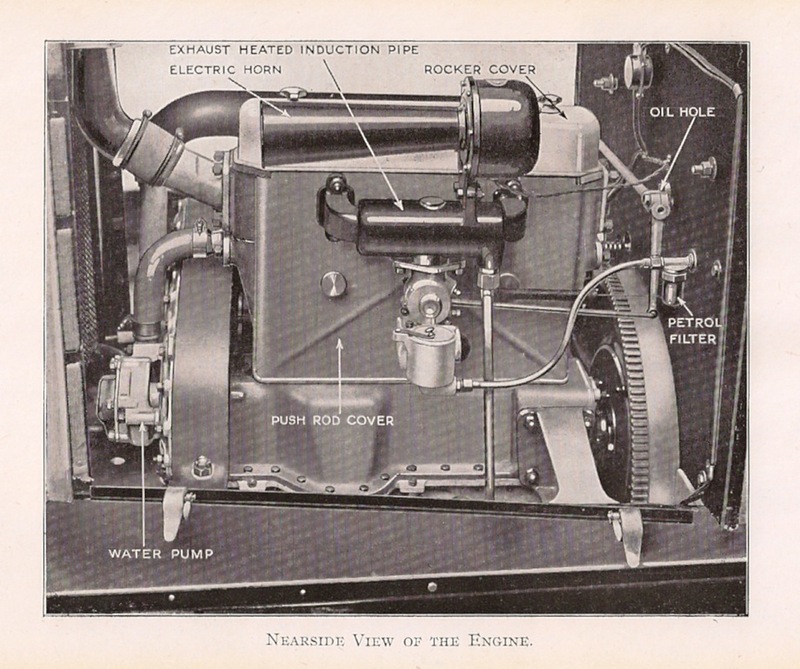 The change meant that the inlet was directly pre-heated, but the negative affect of this was to create a more complicated inlet path within the engine and to move away from the efficient crossflow of gases in the earlier engine. 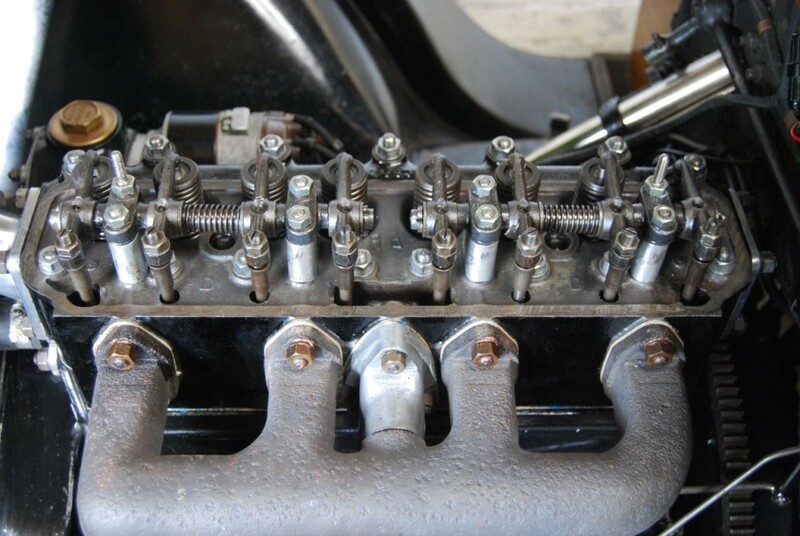 The firing order is 1, 2, 4, 3. 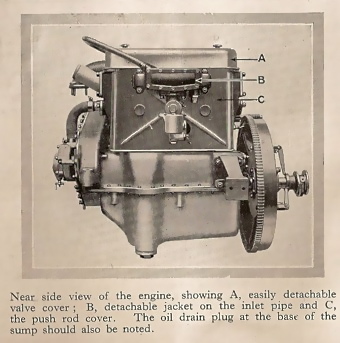 Overhead valve engine of 14 HP Armstrong Siddeley made 1927. It’s important to oil the rockers and tappets regularly. 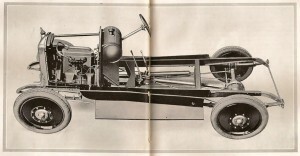 Below is the final version of the 14 HP chassis from the 1928 catalogue showing the models for 1929, the last year that the 14 HP was sold. 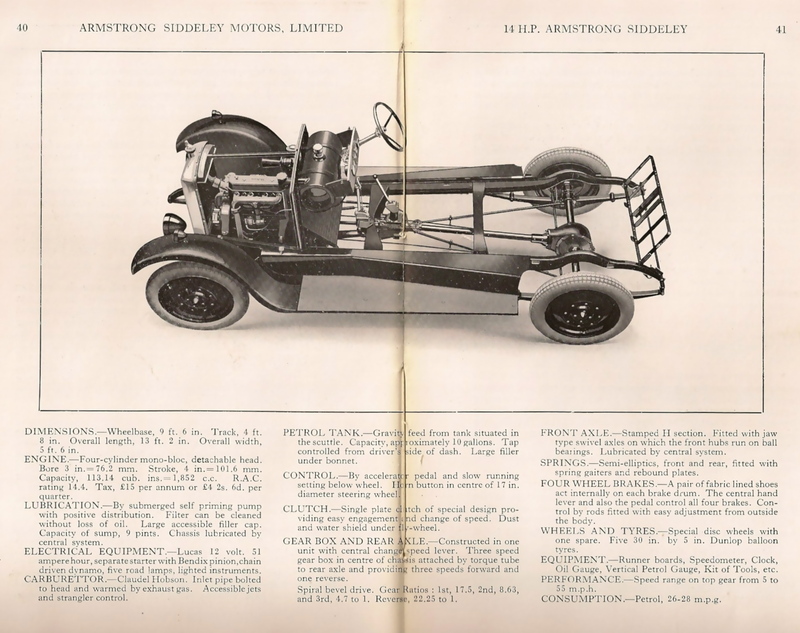 Armstrong Siddeley changed the design of the rear chassis, axle and springs to lower the ride. A better view of the chassis for cars made 1928-9. 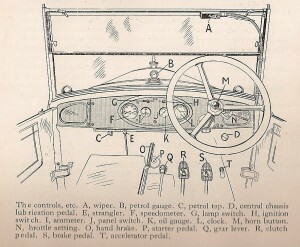 Note the gate fitted above the gearbox and clustering of instruments on the dashboard. I have found this article on maintaining and repairing the Armstrong Siddeley 14 HP a useful addition to the information in the handbook. It was published in Motor Commerce in January 1926. 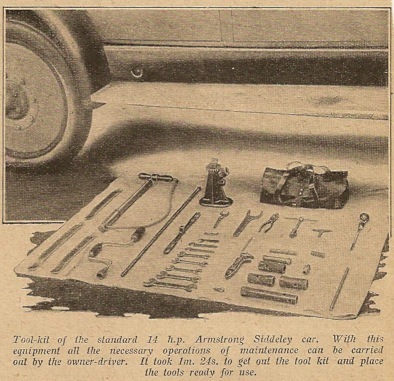 The 14 HP, like other Armstrong Siddeley models, was supplied with a full toolkit. 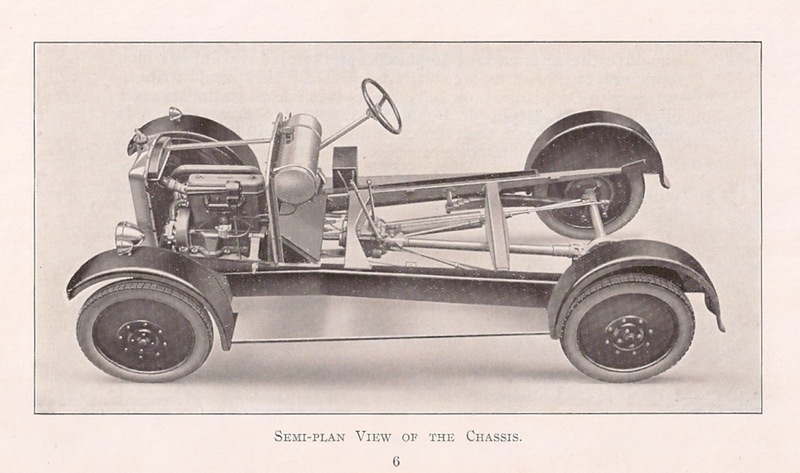 The Autocar magazine featured it as part of their test of the model published ?5 March 1926. The second image shows the car in the test bay. 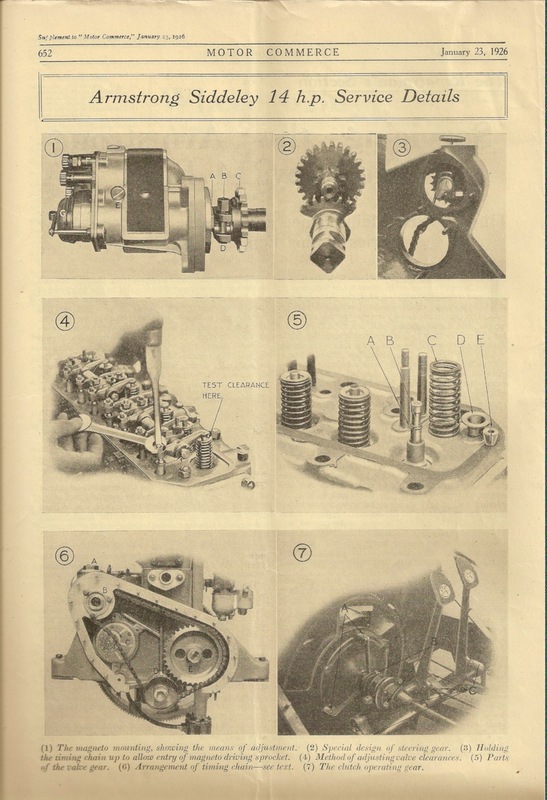 The article asked “How long does it take to attend to the various odd jobs, like lubrication, adjusting brakes and so forth, which must be done if the owner-driver wishes to keep the mechanism of his car maintained always in perfect running order”. Timings included greasing the chassis 9 minutes; cleaning oil filter 2 mins 36 seconds; testing and inflating tyres 10 mins 30 seconds; and adjusting all four brakes 13 mins 30 seconds. The total time for the year’s maintenance for 10,000 miles was estimated at 10 hours 39 minutes. I am completing the restoration of a 1925 (maybe early 1926) Mark 11 – 14HP A/S (pram handle) and am having a bit of trouble with the front spings. I think that I will need to have springs remade. Can anyone assist me with the original specs for the front springs. I have two different springs and I don’t know which one is the correct one, in fact both may be incorrect. I am in Australia, my dad had two 14hp Armstong Siddleys from the late 30s to the late 50s, I was born in 1937 and as long as I can remember the roadster was sitting in the back yard, wheels offs and partially dissmantled. The tourer was the one and only everyday car. My dad kept the tourer running throughout the war years, tactics such as putting one tyre over the other and sometimes glueing bits of tubes to the outer. I think he started it on petrol and may have used a mix of kero and petrol to run. The flywheel was worn and the starter would not engage, he used to lift the bonnet and roll the flywheel to a good spot. One of frequent trips included an area with trams and quite steep hills, you probably know the Armstrongs had to be wound up to climb hills, he used to get so frustrated when a tram baulked his wind up run. I eventually learned to drive it and got my drivers licence driving it. We go to a lot of car shows, and I have never seen an Armstrong like dads, I gues they have all gone for scrap over here. I know this does not help withyour spring query. 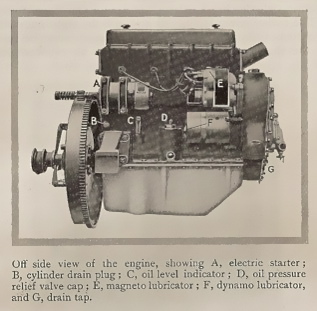 HI I AM CONVERTING MAGNETO ON14 HP ARMSTRONG SIDDLEY 1926 TO ELECTRONIC SPARK WITH MODULE AND ELECTROIC DRY COIL DO YOU KNOW WHAT THE FIRING ORDER OF THE ENGINE IS? CHEERS KEN. Just another note about the 14HP, in the forties and fifties, the Melbourne Museum had a 14 hp engine in a glass case cut away to show the crankshaft and cylinders. it was driven by an electric motor. I think the viewer pressed a button on the case and the motor would turn over about ten revolutions. I have searched the Museum’s archive and can find no reference to it, so I suppose it went to landfill.